If you’re hiring a caregiver for your aging parent, vetting the potential applicants may seem like an impossible task. You need someone who has the necessary experience to care for your loved one and can click with him or her on a personal level. Here are a few tips for choosing a high-quality caregiver. Before you can begin the selection process, you need to assess your loved one’s needs. Caregivers can assist with household upkeep, personal care, cooking, and other daily tasks. Make sure to ask your loved one what he or she hopes to gain from having a caregiver. Your loved one may have difficulty with things you haven’t considered, like opening the mail or answering the phone. If you are the primary caregiver for a senior family member and are looking for professional home care, Richardson Home Care Assistance should be your top choice. Our dedicated and compassionate caregivers are committed to helping older adults manage their health and enjoy a higher quality of life in the golden years. Once you have a general sense of what you need from potential caregivers, separate your list into qualities you need and qualities you want. If your loved one has frequent doctor’s appointments, finding a caregiver with a valid driver’s license is something you need. If your loved one’s primary health concern is diabetes, finding a caregiver who is certified to provide post-hospital care might be nice, but it might not be necessary. Create a final list of your wants and needs, then use it during the hiring process to clarify what the job entails. If your loved one has a degenerative condition like Alzheimer’s disease, it’s important to plan ahead. In these circumstances, consider the additional services your loved one may need in the future. 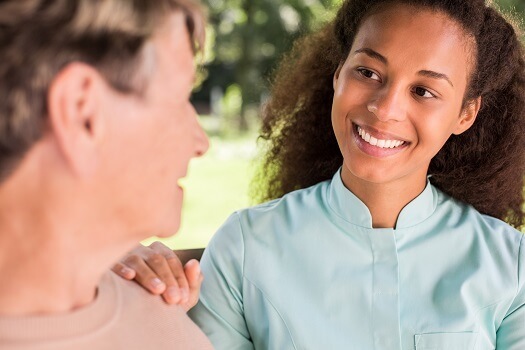 If you’re looking to hire a caregiver on a long-term basis, the caregiver needs to be aware of the services he or she will be expected to perform as your loved one’s condition worsens. Even if your loved one doesn’t have a degenerative condition, it’s always a good idea to think about long-term caregiving goals. Is companionship the most important criteria, or are you looking for someone who can help your loved one recover after an injury? When conducting interviews, it’s important to keep your long-term goals in mind, as it can clarify whether you and the prospective caregivers are on the same page. The most important thing is to find a caregiver who can keep your loved one happy and healthy. Before hiring anyone, make sure potential candidates get along with your loved one. Let them meet, talk, and interact long enough for your loved one to form an opinion. If possible, your loved one should be a part of the hiring process, as he or she will be spending the most time with caregiver in the future. When considering senior care, Richardson, TX, families should make sure their senior loved ones have the resources they need to maintain their independence and remain healthy. Trusted in-home care professionals can assist seniors with daily tasks like cooking, bathing, and exercise, and they can also encourage them to focus on healthier lifestyle habits. If you’re going to trust someone with your loved one’s care, you need the caregiver to be dependable. To ensure prospective caregivers meet your requirements, check into their qualifications, experience, and references. The agency providing the caregiver should perform background checks to ensure their caregivers haven’t done anything in the past that would disqualify them from the position. Families who find it difficult to care for their aging loved ones without assistance can benefit greatly from professional respite care. Richardson, TX, family caregivers who need a break from their caregiving duties can turn to Home Care Assistance. Using our proprietary Balanced Care Method, our respite caregivers can encourage your loved one to eat well, exercise regularly, get plenty of mental and social stimulation, and focus on other lifestyle factors that promote longevity. To hire a professionally trained caregiver for your elderly parent, give us a call at (469) 573-4213 today.